Earlier this week I was asked what I was doing for my birthday this weekend. I usually don't do much of anything for my birthday but thought it would be sweet to do what I love, ride my bike. This morning at 9am I rode to the bridge and was greeted by most of my teammates, a bunch of guys from Team Roaring Mouse, along with several friends from the race scene. 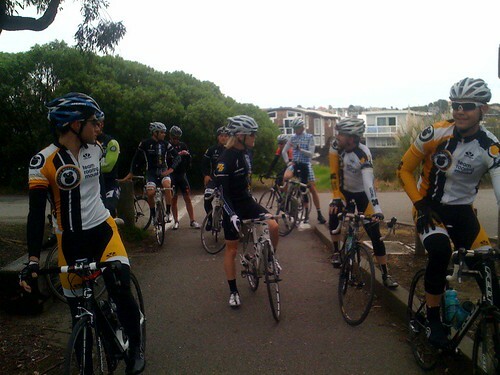 With a group this studly, the advertised pace of medium to mellow quickly went to medium to hammerfest after I jumped for the first city limit sign into tiburon. We continued on Paradise drive in a fast double paceline fashion until Travis from Metromint decided it was time to see who was paying attention and pushed on the pedals. We sliced through tiburon to the end of paradise where I snuck around Ranier for the last city limit sign. I looked behind to see I had opened a tiny gap on Nole so waved at Ranier to jump on my wheel for a leadout into the electric box sprint. However that crafty cowboy caught the train and pipped Ranier. We regrouped at the coffee shop and had a nice mellow ride back to Mill Valley where Shawn convinced me that if I hired him as a coach I would no long crush but mutilate my competition. Thanks to everyone who showed up for the ride!